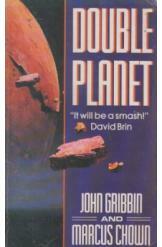 Double Planet by John Gribbin and Marcus Chown, Sci Fi. Book is in good condition, all pages intact. In a future where Earth suffers from environmental collapse, an approaching comet threatens to eliminate any hope for recovery. It is up to a daring team of astronauts to prevent the comet from destroying humanity, and perhaps even use it to create a new home for humanity.